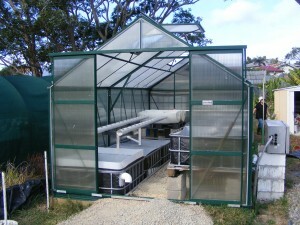 Cutting edge Aquaponics system at the Coffs Regional Community gardens. Aquaponics is fast becoming recognized as the most compact and efficient way to grow many vegetables, herbs, some fruits and many species of fresh water fish in a close to natural system. Aquaponics is a hybrid system between Aquaculture (fish farming) and Hydroponics (Growing plants without soil). 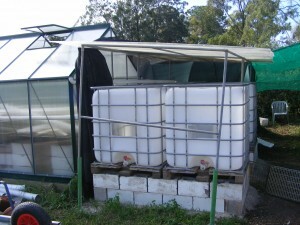 The great advantage of aquaponics is that it solves existing problems with both of its parent systems, namely unused excessive nutrient from fish farming, which is usually discharged into the environment as large quantities of waste water, and the dependency of synthetic nutrients in the hydroponic system is also eliminated and replaced with the processed fish nutrient waste. The system at the Coffs Regional community gardens was made possible by an NRMA community grant for 5K that Steve McGrane successfully applied for in early 2013. The basis of the grant application was to build an aquaponics system that was as fully stand alone and as sustainable as possible. One of the main criticisms of most existing aquaponics systems is that they still feed their fish commercially produced pellets, which are made from the by-product from ‘wild caught’ fish, a clear non sustainable aspect of production. Both Steve McGrane and CRCG coordinator Matt Downie have strong and clear beliefs about the value of organic production systems and the need for aquaponics as another one of these, to be as resilient and sustainable in its operation as is practically possible. The CRCG aquaponics system has been designed to incorporate fish food production on site, this currently includes, compost worms which are a great source of protein and nutrients; Duck weed (Lemna minor) reputedly up to 30 percent protein and packed with fresh vitamins, minerals and nutrients; Guinea pig pellets/dung, are a readymade fish pellet for larger sized fish and can be ground into smaller pieces for younger fish, again packed with nutrients because our guineas have a very diverse and healthy diet. Other foods also planned to be incorporated include daphnia and micro worm cultures and hardy fodder fish like gudgeons and fresh water shrimp. In the end, the diversity and range of nutrient provided to your fish will be converted to the very nutrients available to your plants which ultimately end up feeding you! Another consideration was that the Coffs regional community garden is not connected to the mains electricity grid so the system has been build to run its electrical components of a single 4000L/h pump and aerator to run exclusively on solar power. Long term CRCG member and professional electrician Steve Sloan lent a big helping hand in setting up this part of the system for us. We have 3 x 90 Watt panels mounted together on a VERY heavy duty steel pole perfectly orientated for maximum yearly solar exposure. We have the power cables running down inside the pole itself, travelling underground inside another steel pipe and then entering our fully enclosed battery bank and regulator area. From here then power is taken straight across to the location of both the pump and aerator. 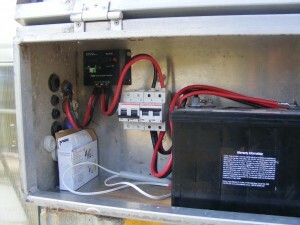 Bothe the pump and the aerator are then connected up with a timer being used to add further power efficiency to their operation and system efficiency as a whole. There are a number of different growing systems utilized in aquaponics systems and the CRCG system incorporated many of these. Firstly the overall system design at the garden can be categorized as a ‘CHOP’ styled system. CHOP stands for “Constant Height One Pump”. This system was developed by a number of different people and has the distinct advantage that the water in the fish tanks is the highest point in the system and stays at a constant height. The dirty water from the bottom of the fish tanks is removed to the plant grow beds, the pump itself is located in a separate sump and should there be a pump failure the fish don’t end up in a diminished water body or left stranded in water that is just a few cms from the bottom as has been the demise of fish in many older styled systems. Our system is largely made from recycled 1000L IBC or Tote drums, 3 of these make our fish tanks, and another one of these catches rainwater from the roof of the hot house for topping up the system where needed. We have 3 half totes with river gravel and Bell siphons, 3 more half totes making up the sump that will also incorporate floating raft lettuce production and a smaller side system of a split 44 G drum water filter entering into two 90mm PVC pipes with holes drilled for small pots to accommodate strawberries and other experimental crops. The wild form of the common gold fish (the Prussian Carp – Carassius gibelio) a very hardy species, a completely different genus to Koi and the Murray-Darling pest carp species , great omnivorous scavenger, fast grower and reputedly VERY good eating. Eel tailed catfish (Tandanus tandanus) is a native Australian species that shows good promise for intensive tank production and well known for its fine eating quality. Jade perch (Scortum barcoo) a very fast growing native fish and reputed the highest in Omega 3 of any Australian freshwater fish. Silver Perch (Bidyanus bidyanus) is a very hardy native species already widely used in aquaculture and aquaponics for its ability to eat a wide dietary range and for its high quality eating. Mullet (Mugil cephalus) the common mullet found in the Australian east coastal rivers and ocean are all able to be converted to living in pure freshwater. Studies recently done on this species at the Marine science research centre in Coffs Harbour are showing this species as a promising potential aquaponics species. In addition to these fish species, the CRCG system will also incorporate native freshwater mussels (Velesunio ambiguious) that will help with the purification system and blue claw crayfish (Cherax destructor) that will also scavenge detritus (dead plant material) from the sump tanks. Because aquaponics is creating a type of semi-closed system, certain elements and microbes need to be added to create the dynamic nature of a natural system. Additional trace elements essential to lush healthy plants can be added via sea weed extract and vital microbial life can be introduced with the addition of a bucket full of natural creek water. These naturally occurring microbes are vital for the processing and recycling of nutrients from waste products from the fish, to fully available nutrients for the plants to uptake from the system. With these vital microbes introduced into the system they then need to have extensive surface area to filter and convert the waste water into usable plant nutrients. This can be achieved with various fibrous filters with vast surface areas and also with floating and trailing water plants that have extensive root systems that can both filter particles from the water and provide surface area for microbes to attach to as they convert the passing waste nutrients into usable plant nutrition. We are very excited about the future of aquaponics for home based self sufficiency and are looking forward to next phase in the journey fine tuning our optimally abundant, fully sustainable organic food production system at the Coffs Regional Community garden. A workshop covering the basics of Aquaponics is being held at the garden on November 23rd from 10.30am. Hope to see you there! Print article This entry was posted by Matt on August 9, 2014 at 12:11 pm, and is filed under Aquaponics system, Combine St Community Garden, Community Gardening. Follow any responses to this post through RSS 2.0. You can leave a response or trackback from your own site.